Mandy, it's not very fair of you to ask him to bare the wound while he's strung so tight about even BEING on the bus! Can I say that I'm already tired of drawing the bus? (so many more scenes in that back seat too... SIGH X( ). Ah well, I'll get over it! I actually had to create a reverse view of the bus for the fourth and sixth frame. So nice we wanted to show it twice! Due to a coding error in the original run of this comic, we felt we needed to make it up to Olga and give her an opportunity to see what a real run of COTW should be! So, once again, Gifts of Wandering Ice, a ICY post apocalyptic world! 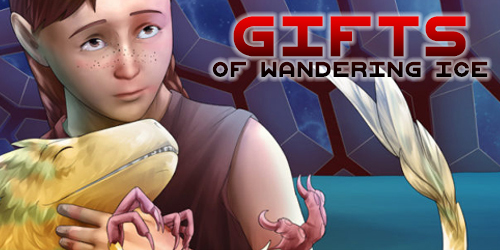 Gifts of Wandering Ice - Sci-fi story about ancient things people find in melting icebergs and the apocalypse that, surprisingly, made humanity better.